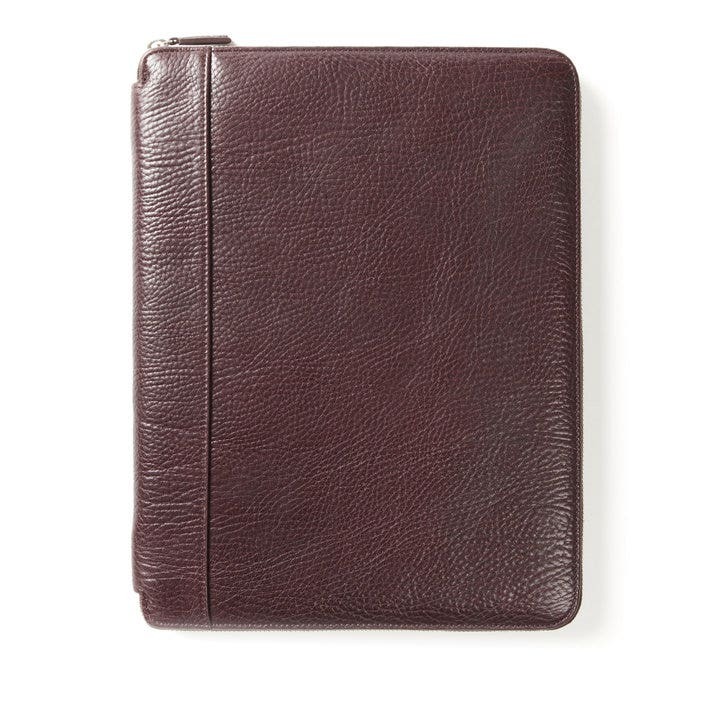 Our iPad Portfolio is the perfect way for a busy student or business professional to stay organized. With room for your tablet, papers, and more, you'll find yourself carrying around less while getting more done! This iPad Portfolio packs a lot more than a normal portfolio. Inside is a pocket for your iPad, Windows Surface or similarly sized tablet, a standard sized letter pad, and an expandable pen loop, so you'll have everything you need to always be productive. A metal zipper opening on the outside wraps it all up, keeping everything inside secure when it's closed. A distinctly rugged leather, our Rustico collection leather boasts a full body and heavy shrunken grain, making it ideal for those who like their leather with character. Produced in Italy in small batches from full-grain Buffalo shoulders, this leather gets its shrunken texture through a natural tumbling process which enables each hide to develop custom lines and grain depth, making every product from this collection individual and unique. Rustico is also vegetable-tanned and aniline dyed, which is the most natural method of adding color to leather, and one that leaves the natural leather surface and all of its original markings completely visible. A hand glazed finish tops it off, completing the look. Inspired by well-worn riding boots and leather-bound library books, this rich red-brown leather is as gorgeous as can be. The quality is outstanding, a relief considering I bought this online and paid a lot of money for it. I got this in Burgundy, which I am still getting used to. It's a little "redder" than I thought, but still dark. I wanted something that was different than all the typical black portfolios, but still professional and, with no apologies, a manly color. Our son is extremely happy to have this portfolio to use for his job. He did the research and put it on his Christmas list, which he sent to us rather late so we couldn’t have here when he was in town for the holidays. We had it sent directly and it got to him with no problems and he’s thrilled. Win-win! My wife LOVES this! The portfolio was handsomely wrapped which made for even more excitement on Christmas morning! These were gifts for Christmas and our children loved them! I Purchased a leather zip portfolio which was large enough to accommodate an iPad for my best friend. He absolutely loves it. It is really a top quality leather Item that he will use every day at work. Great product-beautiful leather, nice job with monogram. Inside pocket would fit an iPad if you wanted to bring it. When ordering the monogram color, keep in mind that the zipper is gold. I ordered silver letters on my blue portfolio, which looks just a little funny next to the gold zipper. I looked everywhere for a new leather padfolio. Nothing met my expectations, and I resorted to looking online. I was hesitant to purchase one just by looking at it online, but I made sure to thoroughly research the product and read every review. I opted not to get it engraved in case I wanted to return it. When I received my item, I was in awe. The presentation was impressive. It came wrapped in a soft material inside a quality constructed box that shimmered. The padfolio itself is a dream to touch. It is soft and well made. I was nervous about the color because it looked different on two phones, but when I received, I fell in love with the color. I purchased it in ginger. The zipper is easy to open and close. The selling point for me was that it has a pocket large enough for a file folder. When I tried it, a folder fit perfectly and I was able to close and zipper the padfolio without it bending the folder's tab. I am thrilled with my purchase and will be a repeat customer. Now I need to get it engraved. If you are looking for the perfect portfolio, this is it. The leather is high quality and everything is put together quite well. It is an elegant and sophisticated product. I opted to have my initials embossed. I am very pleased.